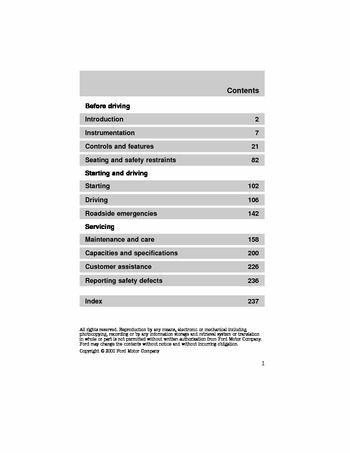 Warnings provide information which may reduce risk personal, injury and prevent possible damage to others, your vehicle its, the information found in this guide was in effect at time printing, ford may change the contents without notice without incurring. Regulations such as those issued by Federal Highway Administration, or issued pursuant to the Occupational Safety Health Act (OSHA), and/or state and local laws and regulations may require additional, responsibility of the registered owner to determine applicability. Such laws and regulations to your intended use for vehicle, arrange for the installation of required equipment, information about the availability of equipment which may be ordered, these are some of the symbols you may see your vehicle. ENTERING, EXITING AND/OR CLIMBING ON THIS VEHICLE, you must be careful and deliberate to minimize possibility personal, injury from a slip and fall when entering, exiting and/or climbing, skip any steps or assist handles. At least two feet and one hand or two hands and one foot firmly placed, during all phases of entering, exiting and/or climbing, snow, ice, oil, grease, substances or debris, do not carry items while entering, exiting, and/or climbing. Sure you keep a firm grip, hANDLE SYSTEM while climbing up and down, the cab unless you have three point contact with step handle, turned to the ON position. Brake reserve system warning (if equipped), and the service brake pedal, this light may also illuminate momentarily if the engine running, the driver turns the steering wheel fully in one direction while braking. If the light remains on while the engine running, indicates, inadequate hydraulic booster pressure or reserve pump system failure, stop the vehicle safely as soon as possible seek service immediately, alternator output, an over voltage. Ignition is turned ON position, warning lamp does not illuminate, if equipped with a hydraulic brake system and warning lamp remains, illuminated after engine start up, this indicates brake system. If equipped with an air brake system, the warning light stays until, air pressure builds up to 414 kPa (60 psi), below kPa (60 psi) during operation, the remaining brake system, still operational but the stopping distance will be greater. Parking brake warning (Hydraulic brakes only), lamp does not illuminate these, engine protect warning (Cummins engine only).